2016 started off rocky and looked bleak and uncomfortable. (I remember at the time looking forward to the end of the year already because I couldn’t wait to reflect on the entire year and write this post to wrap it all up lol.) Then, after my trip mid-way in the year, things took an upward turn and became so much better! Despite everything that happened in the beginning months of this year, I have to say that this was an overall great year because a lot of wonderful things happened and I embraced the rollercoaster changes that had to occur to bring me to a better point: I escaped concluded the network marketing company that I was in for 2.5 years and came to terms with real life again. 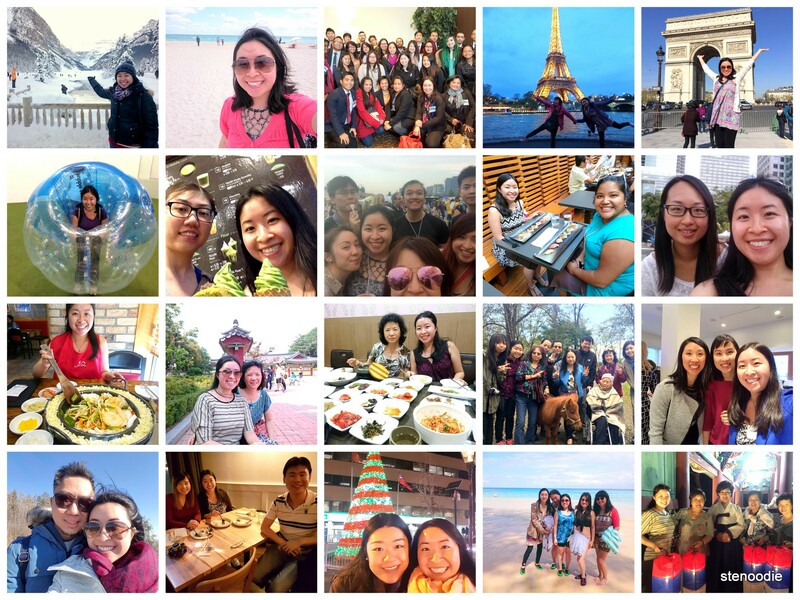 There were a lot of travel adventures this year, food adventures, reuniting with true and good friends, and a new love. Steno adventures re-continued and I couldn’t have been happier for that. I continued blogging every single day as much as I could and shared online my photos of mostly food and things I saw and experienced. January: The new year kicked off in Calgary, Alberta. We also visited Banff! February: Third cruise to the West Caribbeans and trip to Miami. This time we were able to visit a private beach in Bahamas as well as climb Dunn’s River Falls in Jamaica. April: My first time to major parts of Europe! I visited France, Germany, Luxembourg, Netherlands, and Belgium! It was an amazing week of touring around Europe. September-October: Hong Kong; Gangneung & Myeongdong, South Korea; Hokkaido, Japan. A full 30-day/one-month trip to HK, SK, and J! It was amazing. Lots of family time and I managed to squeeze in as many food adventures as I could too. The food adventures continued this year thanks to blogging and sharing photos online. I am always grateful for the foodie events I had this year. Due to more food instagram accounts and restaurants giving priority to those, I had actually fewer events this year. I really enjoyed it that way. I appreciated the private events more than the big media outings. I also received my very first food blog commissioned job! I’m thankful for 2016 and all that it had to offer. For the coming year 2017, I wish for more travelling, food adventures, deeper connections with family and treasured friends, growth in my steno abilities, and extra income on the side. Health and happiness are also priorities of course! On blogging: Although I really enjoyed blogging every single day and challenging myself to see if I could, I’ve proved to myself already that I can do it. I can stick to a daily blogging schedule and publish a new post every day. I know that isn’t easy but I have managed to do it. Yay me! For the new year though, I’m not going to push myself to blog every day if I really don’t have anything lined up to blog about. Although this blogging journey has been fun, at the end of the day, I might not want to share everything anymore. I think I will blog less this coming year in 2017. In steno, my goal is to report more. My goal is to work a minimum of four days a week every week. I want to be busy but not so busy that I’ll burn out or experience physical illness. I’m young; I have the time and effort right now to work more. I plan to be put on more reporting jobs. I plan to be interested in captioning again because that would be a really nice area to work in for better pay. I plan to be more capable of churning out professional transcripts — I have been getting better at it this year and I have been really proud of myself for that. Yay me! 🙂 I plan to network more in reporting as well. I shouldn’t need to say this, but I will be a certified ACT which will allow me to take on court transcripts across the province. Met a really great guy this year. The goal is to nourish the relationship and see it grow to something more. This entry was posted in Life and tagged adventures in 2016, lessons in 2016, memories of 2016, what 2016 looked like for me, what I learned in 2016, Year in review 2016 stenoodie. Bookmark the permalink. Nice specific goals that you have set for yourself, Karen. Happy New Year! Thank you so much, Teri!! I will visit your blog shortly to check your posts out too! Did you write any goals for this year? I plan on us achieving our goals together too! 🙂 Happy new year!! Omg I replied the wrong thing for the wrong post… LOL that comment was supposed to be for the other post. Alo! I absolutely loved that restaurant. I also enjoyed my dining experiences at Yasu, DOMA, and Te. 🙂 What about you, Mike? Oh Alo…I keep hearing amazing things about that place but it’s almost impossible to get a reservation there! People say it’s the first Michelin star quality restaurant in Toronto. I liked Boralia and Yasu (although Zen is almost just as good). I will support you forever!! Catching up on your posts. Amazing goals, darling!